The Johnson strength line gives new meaning to the term traditional strength training. 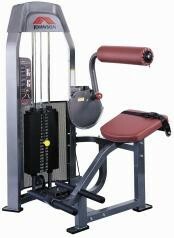 It was designed to meet the fundamental needs of your fitness facility, with a strongly featured industrial design, using smart biomechanics and ergonomics within a durable, reliable design. Its equipment that is designed to be effective and safe and the results will speak for themselves. Instructional Placards: Vibrant and color enhanced instructional placards provide simple to follow illustrations and instructions on the proper use of the exercises. Weight Stack Shrouds: Standard full rear weight stack shrouds enhance the visual appearance of the machines. Seat Mechanism: Ratcheting seat mechanism effortlessly adjusts in 15mm increments for precise fit. Cam and Counterbalance: CNC laser cut exercise cams ensure proper curves for more comfortable and effective workouts. Industrial Design: Weight stack frames were designed to be visually distinct creating a new dimension on the traditional design of selectorized machines. All pulleys on the weight stack tower are internalized within the frame eliminating visual distractions.